Ex-Royal Mail Chef Dan Hunter outside his new restaurant Brae. The chef who brought three hats to the Royal Mail Hotel proves he’s still at the top with new restaurant Brae, says Susan Gough Henly. This is a tale of a jolly jumbuck, a meta barbie and plans to grow heirloom wheat in the paddock. A modern Australian fable, really. At the centre of it all is chef Dan Hunter who, with a couple of partners, recently purchased George Biron’s eponymous country restaurant Sunnybrae, complete with vegetable gardens and orchard. The 30-acre property in Birregurra, at the fringe of Victoria’s Western District sheep country, on the back road to Lorne. 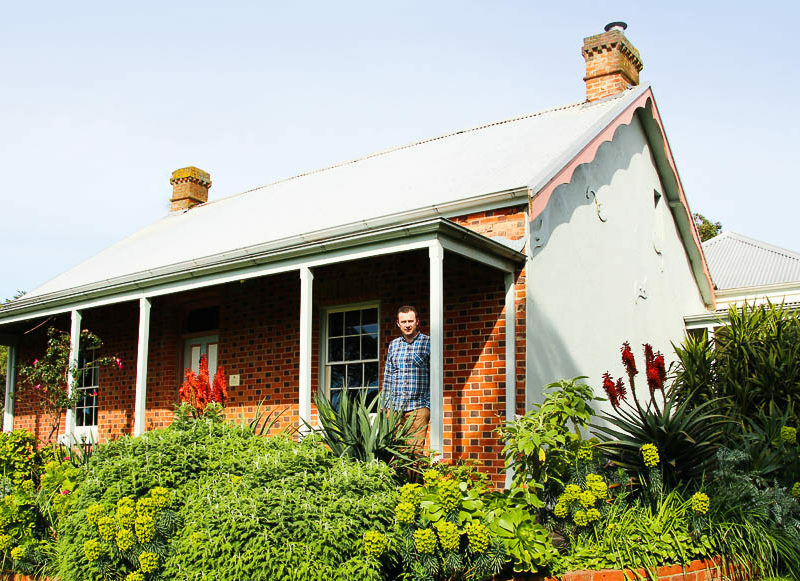 When he was chef at the Royal Mail Hotel, Hunter proved that kitchen artistry could lure gourmands from South Yarra and Surry Hills to Victoria’s ‘outback’ town of Dunkeld at the foot of the Grampians. No one seemed to mind that it was a hefty four hours’ drive from Melbourne. By comparison, his new Brae restaurant feels like it is practically in the city’s backyard, a mere 90-minutes from the Westgate Bridge. But back to the jumbuck. I’d like to ask whether any of you Waltzing Matilda Aussies know exactly what a jumbuck is. To cut a proverbial ballad short, it is not lamb (which is under 12 months) and it is not mutton (which is one to two years old); it is a four-plus-year-old sheep with a mouthful of ugly teeth but a heap of flavour on its bone. Maître d’ Simon Freeman (also of Royal Mail heritage) and a black-clad staff member present this as dish number five of nine: Dry aged jumbuck with grilled lettuce on a matte, Kaiseki-like charcoal plate by Melbourne ceramicist Glenn Tebble. An ode to exquisiteness. Yet nothing, especially not here, is as simple as it seems. The restaurant itself is practically unrecognisable from its earlier incarnation as Sunnybrae’s rustic cottage. The outside is untouched but inside, Melbourne architectural firm Six Degrees has created a minimalist space, with a hint of country in the wainscoting and a dash of Japanese aesthetic in the iron and glass boxes used as waiter stations – a perfect metaphor for Dan Hunter’s cooking. The chairs are Italian, sleek and supremely comfortable. The exquisite, organic crockery is created by Made in Japan, MUD Australia and the aforementioned Glenn Tebble. But it is the food that exerts the centrifugal force at Brae. The simple listing of ingredients in each dish is a foil that hides astounding juxtapositions. Not everything works, but standouts are the starter of wallaby and flax, lemon myrtle and wattle (tartare of saltbush wallaby, unique to Flinders Island and enhanced by intense bush tucker flavours), and the salad of sweet Portarlington mussels with blue-eye salt-cod cream. And, of course, the jumbuck. To create this dish, the meat’s thick layer of protective fat was first cut away to reveal pure lean meat on the back strap. It is seared, then grilled on a barbie – not just any barbie, but a Spanish-style adjustable grill surrounded by heat-retaining stone, installed in homage both to the good old Aussie variety and to Dan’s days as head chef at acclaimed Spanish restaurant Mugaritz. It sits behind the Alan Scott-designed wood oven, which bakes Brae’s sublime wholemeal sourdough bread that is served with virgin butter… but that’s another story. The meat is sliced paper thin and mixed with tuna mayonnaise enriched by tarragon, fennel and chives. Cos lettuce is brined and charred quickly on the barbie. And for final presentation: the jumbuck, herb and tuna mayo sits on a smear of green puree made from broad beans and garden peas, hazelnut and yoghurt, then delicately wrapped with the grilled cos. A white puree made from blitzed whole lemons soaked in soy milk is swirled on top and the entire dish is finished with a dusting of oyster powder and a few drops of anchovy water. The sweet and sour, the rich and creamy, the herbaceous, and the savoury create a tantalising array of tastes all over your mouth. If you elect the matched wines, you’ll discover that a 2011 Apis Cabernet Franc from Henty near Portland, adds yet another earthy note to the dish. Spend time with the wine list for it offers a magical mystery tour, rather like Dan Hunter’s cooking. Yes, there is a sprinkling of iconic labels from across the world but more interesting are discoveries from artisan winemakers dotted around Victoria – the likes of Mac Forbes and William Downie in the Yarra Valley and Garagiste in the Mornington Peninsula – who tweak the classics or offer under-appreciated varieties in a new light. But it is the two astounding desserts – watermelon, snow peas, rhubarb and rose, and the parsnip and apple – that seal Dan Hunter’s reputation as one of the most inventive chefs working anywhere in Australia. BYO swag – you won’t want to leave. The verdict: An immersive experience that is both intellectual and sensual. This isn’t just a relocated Royal Mail; it is a new adventure with fewer deep pockets but more resourcefulness. We rated: The sense of discovery in the surprising and intricate flavour combinations. We hated: Art is very personal but we didn’t like the brightly coloured abstract paintings from three contemporary Victorian artists. Notes: Nine-course prix-fixe lunch and dinner: $180 per person ($150 vegetarian option). Matching wines, add $120 per person.